Michaela B. was born in Brooklyn and returned to her beloved birthplace after graduating from the University of Florida. Since her return, she has become known for spreading her undeniable love for her city; which of course is the Brooklyn way. Before finding her calling in the world of real estate, Michaela traveled the globe as a touring Wardrobe Stylist to high profile clientele. Her innate creativity combined with her exceptional communication and negotiation skills have served her clients well in both fashion and real estate. As a real estate professional, Michaela is known for her integrity, professionalism, and sense of humor. Her propensity towards positivity and attention to detail allow her to mitigate even the most difficult transactions with warmth and grace. 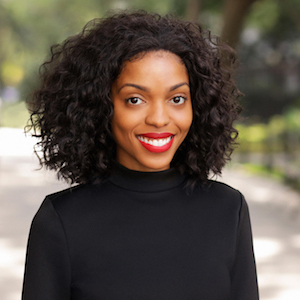 When Michaela takes time for herself, she studies meditation and contributes to her community both as an active member of Delta Sigma Theta Sorority, Incorporated and by volunteering with FreeArts NYC. She also enjoys reading, making memories with loved ones, and supporting Brooklyn's minority-owned businesses.